We are encouraged to always be thoughtful and engaged and caring. To be inspired and fueled. But as someone trying to create, I find that sometimes I need to shut off the depth. To forgive myself if I don’t feel inspired every moment of the day. That sometimes, you have to shut off the thought. And just do the boring hard work even when I don’t feel inspired. Just do the boring hard work, regardless of that tugging feeling in my gut questioning if it’s the right direction. Just do the boring hard work when no one pays any attention. Just do the boring hard work when I have zero motivation. Just do the boring hard work – in rote, almost mindlessly – because that is the only way to keep momentum going. I am not one to often recommend being mindless, to work without spirit. Because I have such as respect for being present. For caring. For giving. But I find that the habits which create the foundation for creative work require me to show up. That there are only a certain number of fueled creative hours in a day. I have heard the number as three or five of these hours, but imagine it is different for everyone. And then so many hours left over which are filled with distraction. The hours where it becomes easier to check email, to check social media. To want to react rather than create. Because reaction removes the need for initiative. As I speak to more and more people who are mid-life, mid-career, and fighting hard to turn creative vision into reality, I am coming to a conclusion: That oftentimes we fail creatively because we don’t work when we don’t feel creative. Because we only want to work if we are convinced of the vision at every moment. If the world validates our ideas at every moment. And that is rarely the case. This week I visited the Lincoln Memorial in Washington, D.C., and was blown away by how powerful of an experience it was. Today, I want to explore what I took away from it, and how I feel it applies to your journey as a writer. The Lincoln Memorial requires you to take a long walk to get to it. There is no easy access via subway and you can’t park close to it. When you arrive, there are not touchscreens or interactive elements, just marble and stone. So here I am staring at a larger than life sculpture of one man whose actions had profound effects on millions to this very day. But I couldn’t help but consider the community around him that made his actions possible. That without so many others, there would likely be no monument. For each of us, other people make our own achievements possible, either directly or indirectly, either within our time or before it. Sometimes these are positive actions from those we know well, such as a friend who reaches out to a bookstore to get you a book signing there. But oftentimes, it can be what seems like a negative action from those we barely know: the job that lays you off, setting into motion your reinvention from an accountant to a writer. For those who have been through the publishing process, they understand that success as a writer is not about the greatness of one person. It is often built on the shoulders of others, a group project where the writer is works with many others: publishers, agents, editors, spouses, friends, and of course: readers. 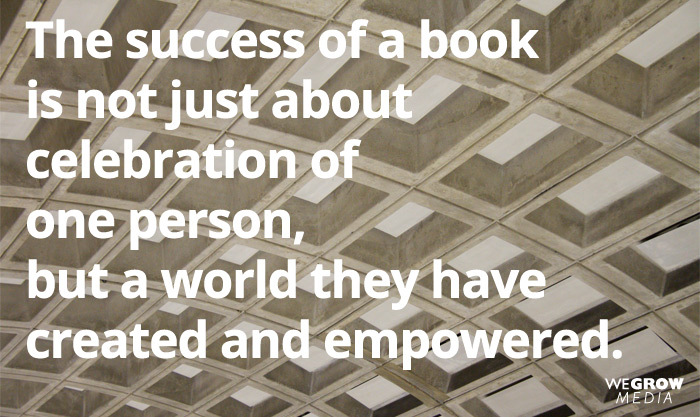 Likewise, the success of a book is not just about celebration of one person, but a world they have created and empowered. When I stand in the Lincoln Memorial, I am reflecting upon not the person of who Abraham Lincoln was, but the powerful effects of his life. What he now represents beyond just being a single person. 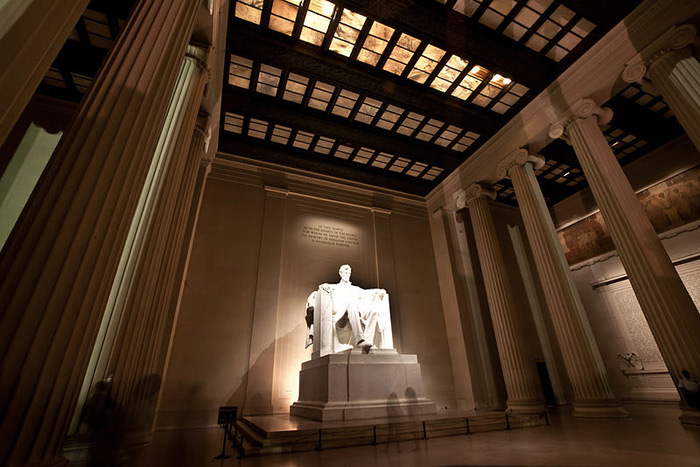 Flanking the statue of Lincoln in two massive rooms are inscriptions of Lincoln’s most famous speeches, The Gettysburg Address and his Second Inaugural Address. Reading them, carved into stone, in a font that is half a foot tall, the power of these words is overwhelming. 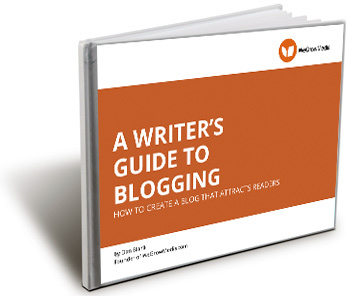 Too often, writers focus on the goal of publishing their book, and beyond that, book sales. They see the process of writing as one of endings: finishing a manuscript, getting the book published, making a sale. But really, writing is about beginnings. About the power of words, and what it starts in others. Our words are ways we extend our reach, the ways we funnel our experience and ideas and knowledge into something that can reach others in powerful ways. 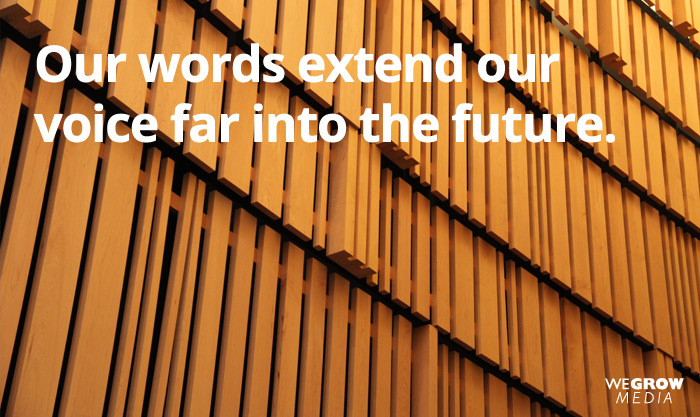 And also extend our voice far into the future. And of course, there are obvious connections here: this very platform of the Lincoln Memorial became the place that Martin Luther King, Jr. delivered other amazing words that reshaped a generation with his “I Have a Dream” speech. The point of the stone monuments is to try to ensure these ideas last. And that is the the point of writing and sharing and publishing for many writers. 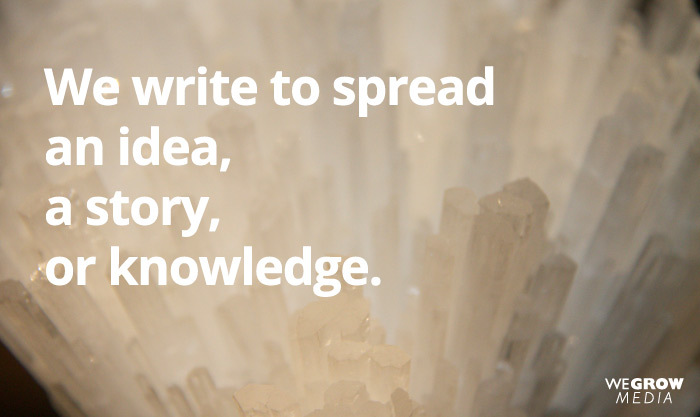 To spread an idea, a story, or knowledge. To help ensure it lasts. You likely aren’t working with a chisel and stone to create your words, but rather a pen or a keyboard. Perhaps your words will not reshape a nation, but they can very well reshape the potential in one person’s life. 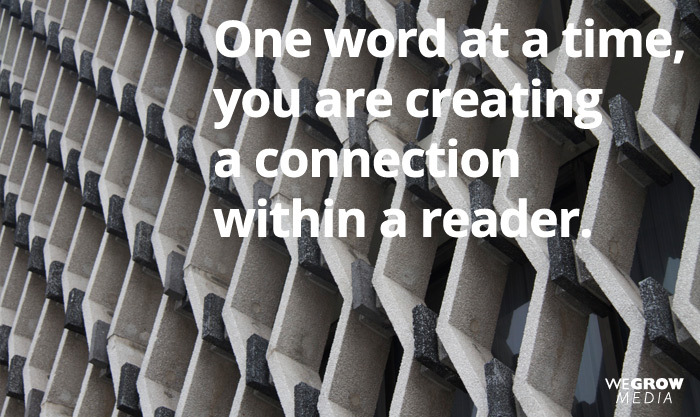 One word at a time, you are creating a connection within a reader. And who knows to what amazing things that can lead. I try to keep this in mine for my own work, and in the courses I teach for writers such as Build Your Author Platform, or my new ebook: A Writer’s Guide to Blogging. The goal is to help ensure writers focus not just getting their work published, but that it has an impact on people’s lives. 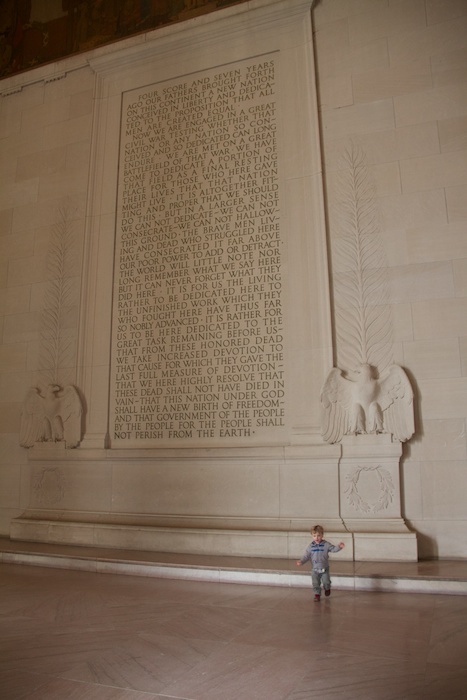 Standing in the Lincoln Memorial, I am reminded that what we create today has the potential to outlive us by generations. And while I won’t pretend that my work has even the tiniest resonance of what Abraham Lincoln has achieved, it won’t diminish my willingness to try anyway. Author Dan BlankPosted on March 8, 2013 Categories Writing8 Comments on How Do We Open The Door For Success As Writers? By Shipping. And that isn’t true. Now, I will admit, it can be HARD to be a writer. But that is nothing new. I would say that it is easier nowadays to be a writer than it ever has been before. If I didn’t launch a new venture at 37 years old, then how could I do it at 40 or 45 or 50? What am I waiting for? Now that I am 3 years in, I don’t even have the words to express how thankful I am that I made that decision 3 years ago. It is far nicer to look back at what I have accomplished (and the lessons along the way), than look back and see nothing at all. No ups, no downs, no process of learning. Just stagnating. Waiting. Procrastinating behind thin excuses. It is even nice to look back on my failures. Why? Because they are BEHIND me, not just some ‘fear of failure’ that I project into the future. Information, inspiration, and other people can be essential building blocks of finding ideas, writing your book, and speaking with those you may need to in the course of creating it. You are just a web browser away from connecting with each of these things, or finding in-person resources to do so. Not only that, there are organizational tools to help you organize your writing, your ideas, your contacts and your research. The act of ‘publication’ is no longer a closed system where you NEED to convince others that your book is worthy of publication. Yes, those processes still exist, and still work. But you now have more options. Self-publishing has not just opened the door technologically, but even socially. Years ago, if you self-published, it would be called “vanity publishing” and there was an immediate stigma associated with the book. That negative stigma is gone. By estimates I have seen, 1.5 million books were published last year, and more than 2 million will be published in the next year. The act of ‘publishing’ is no longer the barrier for entry if you want to be a writer. One word: Amazon. Okay, that is too easy. There are a variety of companies and ways that are making it easier and easier to transfer a file or a physical object from you to a potential reader. With ebook cutting the cost of book production to almost nothing when compared to print books, a range of new solutions are open to authors. You no longer have to worry about committing thousands of dollars on an initial print run, warehousing costs, mailing costs, and customer service when these processes break down. Not sure who your potential audience is? It is now easier than ever to find out, to do research, to connect with those who can help you find readers who will love your book. I am not talking about publicity here, or spamming social media services with the message: ‘buy my book!’ I am talking about building the relationship you need to truly connect with readers. Too many writers feel that the sale of their book is the culmination of their relationship with a reader. But when someone pays you $15 for your book, that should be the START of how the two of you connect. What this means is that your effect as a writer is now potentially even greater, that you are focused on developing an audience for your NEXT book, and that people have new ways of aligning with you. Whether you tell stories, share information, help people, challenge them, or entertain them, connecting beyond the book itself opens up a world of possibilities to create meaningful experiences with others. How do writers find ideas that express what they want to share? The process behind coming up with new ideas, and the ability to funnel them into something useful, something meaningful, and something that shapes the lives of others. Establishing a process that focuses on output, on creating work that they are proud of. I always ask writers what their biggest challenge is, and the answer I hear more often than any other is: “I am overwhelmed.” They are overwhelmed with trying to ‘balance’ it all, to find the time to write, publish, develop an audience, work a day job, attend to their family, and simply to live the life they envision. Shoving more into your day is not the answer though, and this is a topic I will be attacking in a huge way this year: helping writers find the process they need to do what matters most to them. Here, I extend the work I have done with author platform, ensuring that writers are able to not just publish a book, but find an audience for it. This is not just about ‘marketing,’ this is about contributing to the community you are most passionate about. To consider that one of the most important parts of being a writer is ensuring that their work reaches people who will love their work, and truly shapes their lives in profound new ways. How do we we manage our days and our attention? How do we make meaningful connections with others around our writing? That is why my year is focused on helping writers with creativity, productivity, and community. And why I feel that right now is the best time to be a writer. That is, if you are ready to work for it. In this guest post, Writer’s coach and author Cynthia Morris shares what she learned from launching her self-published novel. Disclosure: Cynthia was a client of mine, and I helped her strategize her launch process. Also: she’s pretty awesome. When I made the decision to self-publish my novel Chasing Sylvia Beach, the possibilities excited me. I knew that creating and launching a novel takes an enormous amount of work. But I also knew that if I found the right perspective, the work wouldn’t seem so daunting. I chose to lean in to my experience as a businesswoman. After all, I’ve been writing and launching products since 2000. Launching a novel couldn’t be much different, could it? A month post-launch, I can report that it’s not much different than the other e-books, courses and retreats I’ve launched through my business. But what was different about the novel was the depth of personal connection I have with the book. Deep in the process of writing seventeen drafts, I had to pop my head up to see the bigger picture. I needed outside, expert perspectives to help me see what I couldn’t and to help me plan the project’s entry into the world. The process of launching taught me a lot. I now know that the same principles that apply to my business also apply to a novel launch. I worked with Dan Blank to help clarify my vision and develop strategies and tactics to achieve that vision. Define my reader for the novel. Shift from writer to marketer. Make good decisions with an eye to the long view. Be unique in my launch offer. Investing time in the thinking and strategizing process is something many people don’t consider until the eve of the launch. I started a year before launch to plan my content strategy, design my novel’s web site, plan the launch while continuing to build my audience. The time I invested beforehand helped me feel both empowered and strategic with my launch. Here’s how I responded to the challenges mentioned above. This is a step that many creative people miss. We get so caught up in our ideas, we forget that in order to sell something, it has to appeal to a buyer. A specific kind of buyer. I know my audience for my business, Original Impulse, where I coach writers through their own creative blocks. I knew I had a lot of reader loyalty but would they want to buy and read my novel? My initial mistake was to assume that all people in my network would be interested in my book. But I realized that just because they follow me to learn to write more and be more creatively expressed, doesn’t mean they want to read my novel. With Dan’s help, I refined my definition of my reader to help target my marketing efforts. One of the biggest challenges writers face is not being able to separate themselves from the writing to have the objectivity required to do the marketing. I wrote Chasing Sylvia Beach because I wanted more people to know about this American expat and her inspiring life as a bookseller in Paris. When I thought about the content I wanted to produce, it was natural that I would tell stories about Sylvia. But it took a bit longer to realize that sharing the themes in my book through stories about my character might also be interesting to readers. Looking at my themes reminded me that what we value most dearly is what we put into our art. This makes talking about the book less an act of marketing and more an act of sharing what I care about. Writing and speaking about the novel and my process of writing it is a reflection of everything that’s at the core of my life and work. Keep trying for traditional publishing or self-publish? Who to hire to design the cover? How to print and distribute? These are the kinds of questions that keep indie authors up through the night. Inherent in any project lies a million little – and big – decisions. Decision-making is another of the big challenges creatives face: we don’t like choosing. When we choose, we lose possibility, and possibility is the darling of the creative. We also get hung up on making the right, best decision at every turn. Many of us experience ‘analysis paralysis’. The inability to drive decision after decision is what lies behind millions of abandoned projects. I wasn’t immune to the daunting responsibility of having to decide about the cover, the author photo, the printing, the launch party. I maintained my momentum by getting professional help from Dan, my mastermind partner Alyson Stanfield and friends. While I had the ultimate say on everything – one of the best reasons to self-publish – I had a lot of targeted input on my decisions. My influencers helped to drive my decisions to be smarter and more strategic. I knew I didn’t have the pull to drive a mega launch. I wouldn’t hit the New York Times bestseller list and I wouldn’t dominate my category in Amazon. But that didn’t mean I couldn’t create something remarkable and memorable. Before brainstorming possibilities, I had to identify my motivation for making something special. I wanted to do a limited edition for my readers. I enjoy the direct connection I have with people who buy my e-books and take my classes. It seemed odd to miss out on that with the novel. Dan encouraged me to bring in my love for illustration and paper products. Part of the reason I wrote a historical novel is my nostalgia for the analog era where paper, pens, books and ink ruled. I wanted to make something that both physically and thematically illustrated the novel. My original impulse was this: to have a library card pocket in the back of the book with an insert of some kind. I envisioned a folded piece like my beloved Moleskine accordion notebook. Still, while the form was clear to me, the content wasn’t. It took a long time to gestate, but when the idea crystallized, I did all the art in one marathon rainy day in Denver. I pulled together the stamps, cards, library pockets and then signed and numbered the art included in the limited edition. The sale of this edition went great. The launch party was sweet and satisfying. I’m still assessing the efficacy of my efforts and I’m still taking daily steps to promote my novel. I’ve been a writer for enough years to know that this career is a long game. We need to find satisfaction from the small victories along the way to our bigger vision. Defining my own success rather than relying on conventional metrics like bestseller or Amazon rankings allows me to continue to own the process. Sure, I still care about sales and want readers to love the book. But I also know that every investment in this book is an investment in my career as a writer and artist. And those are investments I am willing, and luckily able, to make.